Recent research is casting new light on the importance of the southernmost continent, overturning centuries of misunderstanding and highlighting the role of Antarctica in how our planet works and the role it may play in a warmer world. What was once thought to be a largely unchanging mass of snow and ice is anything but. Antarctica holds a staggering amount of water. The three ice sheets that cover the continent contain around 70 per cent of our planet’s fresh water, all of which we now know to be vulnerable to warming air and oceans. 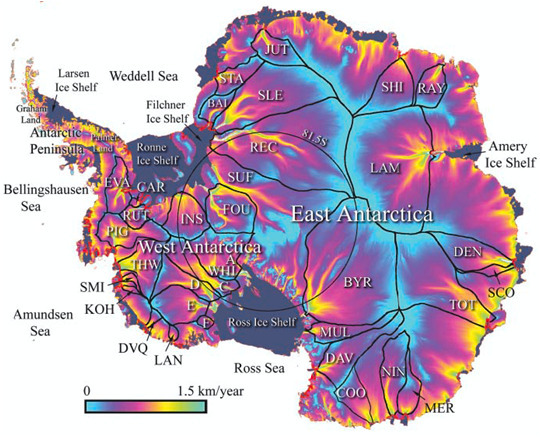 If all the ice sheets were to melt, Antarctica would raise global sea levels by at least 56m. So we now need to reconsider future sea level projections given the potential global impact from Antarctica. Given that 93 per cent of the heat from anthropogenic global warming has gone into the ocean, and these warming ocean waters are now meeting the floating margins of the Antarctic ice sheet, the potential for rapid ice sheet melt in a 2°C world is high. In polar regions, surface temperatures are projected to rise twice as fast as the global average, due to a phenomenon known as polar amplification. However, there is still hope to avoid this sword of Damocles, as studies suggest that a major reduction in greenhouse gases over the next decade would mean that irreversible sea level rise could be avoided. It is therefore crucial to reduce CO₂ levels now for the benefit of future generations, or adapt to a world in which more of our shorelines are significantly redrawn. Chris Fogwill is Professor of Glaciology and Palaeoclimatology, Keele University; Chris Turney is Professor of Earth Sciences and Climate Change, UNSW, and Zoe Robinson is Reader in Physical Geography and Sustainability/Director of Education for Sustainability, Keele University. This article was originally published on The Conversation.